Comes with 2 year manufacturer’s parts warranty and Lifetime warranty on the gearbox and motor. The Simplicity Straight Stair lift Series track offers a continuous charge function meaning that the lift can be parked on any part of the track when it is not in use. This means you do not need to worry about where you leave your lift on the track as the batteries will charge in any position. The Simplicity Straight Stair lift Series are compatible with the Slide Track and manual hinge systems so if you have a doorway close to the bottom of your stairs the Simplicity offers you a range of solutions to prevent the track from causing an obstruction. All straight stair lift have safety sensors on the power pack and footplate: these are designed to stop the lift if it meets any obstruction. Once stopped it can only be moved in the opposite direction of the obstruction. We also supply our stair lifts with an easily accessible key switch that allows you to disable the lift and prevent unauthorized use so you do not need to worry about unsupervised children playing with your stair lift. The Slide Track has safety sensors at both ends, these will stop the track if it encounters an obstacle during use. Your stairlift will continue to move towards the obstacle if desired where, if safe to do so, you can remove the obstruction and continue your journey. Alternatively the track and stairlift can be moved away from the obstruction. A manual hinged rail allows for the bottom portion of the rail to be lifted up out of the way of any doorways or passageways when the stairlift is not in use. A manual hinge works with the assistance of a gas strut, meaning that operation is as easy as possible. Available for the 950 Plus, 1000 and Xclusive models. 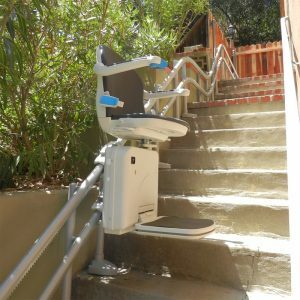 Some straight stairlifts can be supplied with a powered hinged track that automatically extends when you go downstairs, and folds up when you go upstairs or want to park the lift out of the way, allowing clear access on the lower level. I used Towson Medical Equipment. I did have a stair lift that I had put in for my mom years ago, unfortunately she passed away years ago and of course I have not been really using it but then from time to time my grandchildren would come in and use it. Then suddenly it just stopped so I just want to that they would come and take it out because I’m sure the warranty has expired and I am not using it already on a day to day basis so I want them to take it out. So the guy came in, Damon, and he said that they will cut the A-Debit and it would be on it’s warranty but he said that he might be able to repair whatever is ruined and he did and of course I paid for that. He was just respectable because he could have said that I can just pay somebody to take it out but he was able to work with it and it’s working now. That was very good service and they were very responsive also. Amazing info on stairlifts, we used Towson Medical to install our stairlift and they saved us over $3000 from other estimates we got. Can’t Thank you Enough! I had a stairlift installed by Towson Medical some years ago. They were very prompt and polite. Anyway, recently the chair stopped working. I called and they sent someone out the next day to look at it. Damon, who installed my original stairlift, came and found a bad battery. He happen to have one on his truck and in 20 minutes I was back up and running! What great service!